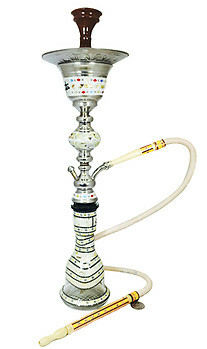 The Khalil Mamoon Sharkawi hookah comes ready to use with an Ice Chamber and gorgeous mother of pearl accents inlaid in a flawless silver finish. The KM Sharkawi is perfect in every way possible, coming straight to us from Egypt where it was handmade by the most experienced craftsmen under the famous, revered Khalil Mamoon brand.This hookah is built to last and sure to impress. The Khalil Mamoon Sharkawi is ready to be used right out of the box, so there is no need to purchase additional parts and your favorite shisha can be smoked immediately!